Today will be UCCB payday for most of you parents out there with kids under 18 years-old, so congrats on the cash! However, don’t forget the old saying that if it’s too good to be true then it probably is. In my last couple of posts, I’ve written about the current Gov’t increase in the UCCB and also wrote a more detailed breakdown of the Trudeau vs. Harper tax plans. Many have asked “why no mention of the NDP?…especially since they’re polling so well? !” Short answer: The NDP kind of has no tax plan relating to families, so it’s tough to compare apples to no oranges. 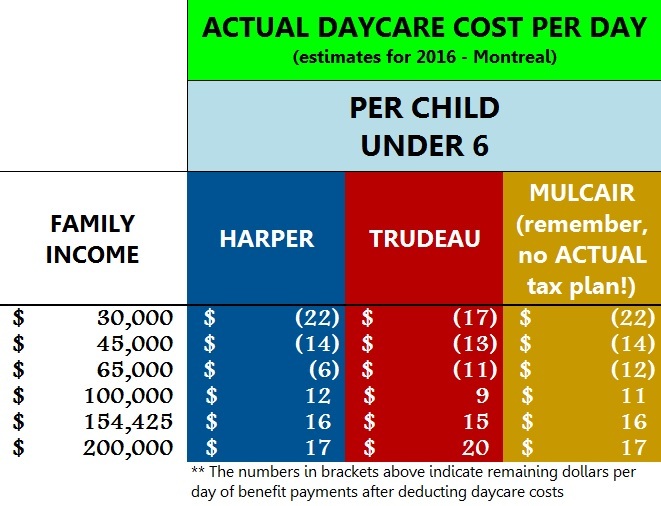 Over 3 years, implement a nation-wide, $15/day daycare plan for which they’ve given no additional details, such as how to deal with the fact that it will HUGELY favour Toronto and Vancouver families (who pay around $60/day on average) while not adding a nickel to the bottom line of families in Quebec or the Maritimes (who pay far less per day). Therefore, adding the NDP to the really awesome tables from my previous posts might be a bit tricky given their rough draft tax non-plan, but I’ll give it a try. For you non-accountants out there, all the detailed info that went into the tables are written below so if you want to use it for a nap-time sleep-aid or even for general anesthetic purposes, please go right ahead. Now, here goes nothing! First, find your city. I made tables for Montreal (go Habs), Toronto (boo Leafs), and Ottawa (Sens army? Really?) but given the info in the tables, you can figure out your personal situation. I also take requests so feel free to request away Vancouverites and Halifaxonians! Now, find your family income in the left-hand column; this determines your tax rate and how much you’ll be earning in benefits in each universe (a Conservative, Liberal, or NDP Government). The resulting dollar values in the table are how much daycare in your city actually costs you based on your family income. If you stop reading here, thanks for getting this far! You are a brave soul and I appreciate all who check out my ramblings. Keep checking back for more posts in the near future. For those reading on, any and all feedback is welcome on how I went about planning this out and the assumptions made. The tables take into account daycare-cost-related deductions and credits and standard deductions (for example, the basic credit that everyone receives and the spousal credit that everyone married or common-law receives). The tables do not take into account other items such as RRSP deductions, medical expenses, etc. Toronto is currently at $65/day. 20% of the difference between $65/day and $15/day = (65-15) x 20% = $10. Therefore Toronto is assumed to be $55/day (65-10). That’s it for now since it’s 2am and I should no longer be crunching numbers at this hour. Stay tuned for more accounting fun as Election Day approaches….I’ll do my best to keep you all informed and all parties as honest as possible! In case you missed it, here’s the audio from my appearance on CJAD, chatting with Dan Delmar about the UCCB increase and other family related tax stuff! If you like what you read, please like my Facebook page and/or follow me on Twitter! And, as always, if you have tax questions, need advice on your personal taxes, corporate taxes or anything else accounting or business related, please contact me (Mitch Kujavsky), AKA The Funny Accountant, either by phone at (514) 833-1158 or by e-mail at mitch@mkassociates.ca. So, clearly when fully rolled out the NDP plan on top of UCCB amounts to a substantial savings for lower income families. I’m not sure what you’re seeing above is necessarily “substantial savings” given the NDP is offering a hybrid of Conservative boutique tax credits and government programming. Like Mitch stated in his opening it’s not apples to apples. The $15/day plan is predicated on raising corporate taxes by an unclear amount and reliant on working with each province to create the spaces. It COULD result in substantial savings if the stars align and you live in the right place at the right time. Key phrase in my previous statement was “when fully rolled out”. You are showing minimal savings in the first year, but not accounting for greater purchasing power as the plan is rolled out. 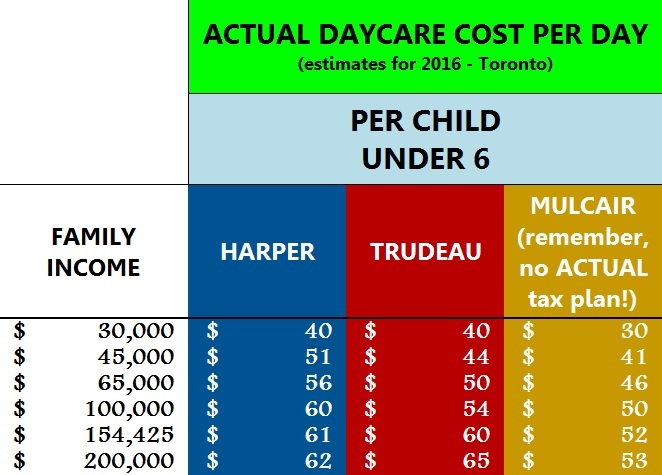 Also, good point about the hybrid nature of combining the daycare plan with a child care benefit, since that might based on my back of the napkin calculations reduce costs for the lowest income tier to $7 a day for full time enrollment, or part time enrollment for free. Keep working on the numbers this stuff is pretty complicated. I wish there was truly a way to break down the actual effect on families’ bottom lines of the 3 parties most significant proposed changes regarding families/children: the NDP $15 program (assuming it ends up being affordable), the Liberal non-taxable UCCB and the CPC UCCB increase. Can you suggest any other items that should be included in such an analysis? I’d liks nothing more than to include proposed changes to the corporate tax rate but it’s impossible to know how many families it applies to. Same goes for NDP proposed changes to taxability of capital gains…. You left out that daycare is much cheaper in the Maritimes because THERE ARE NO daycares… That’s what you get without a plan. Eeeeesh is that true? What kind of shortage are we talking about? Previous Post The Politics of Deception: Harper vs. Trudeau, a Tax Plan Showdown!